One of the most interesting facts associated with the lower section of Luahinealapiʻi (Hapa Trail) is the hula mound Pāʻū a Laka, on the western side of Hapa where it met the seaside Hoʻonani Road. Hawai’i’s hula icon, ‘Iolani Luahine, learned and practiced hula here under the tutelage of loea hula, Keahi Luahine. Keahi Luahine was the foremost hula instructor of her day and one of the last royal dancers from King Kalakaua’s and Queen Liliʻuokalani’s court. 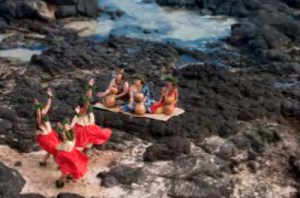 ʻIolani Luahine was admired as a famed hula dancer that preserved the ancient dance traditions and was one of Hawaiʻi’s premier performers and cultural treasures. The resort property of Outrigger Kiahuna Plantation was originally the estate of Hector Moir and Alexandra “Sandie” Knudsen (Hector Moir was the manager of the nearby Koloa Sugar Plantation.) A wedding gift from Mrs. Moir’s father, Eric Knudsen, the newlyweds moved into their beautiful lava stone manor upon their marriage in 1930. Built with lava rocks taken from the area, the Moirs named their home and gardens “Pāʻū a Laka,” or “skirt of Laka,” after the Hawaiian goddess of hula and the early Hawaiian name for the area. Legend says a sacred hula‐training temple was located in the area. Along the paths are magnificent lava rock arrangements. Some of the rock piles are exactly as the ancient Hawaiians left them. Sandie Moir started her now‐famous gardens as a hobby. She first planted tropical plants, such as ginger, heliconia and other flowering plants that required lots of water. Unfortunately, it wasn’t long before it became apparent that these plants would not thrive in an area with such low rainfall. Undaunted, Mrs. Moir continued to explore alternate varieties of plants. She soon discovered that cactus and succulents thrived in the area’s arid setting, and Sandie Moir’s cactus garden was born. Throughout the years, Mrs. Moir continued to add rare and exotic cactus, succulents and other plants and trees, including wiliwili, hau coconut and plumeria.